MECA's MFA encourages students to think across traditional academic boundaries, expand their art practice, and challenge their intellectual curiosity. 24/7 access to state-of-the-art facilities & a vibrant creative community. Structure promotes flexibility and independence. Open houses, virtual Info sessions, Grad National Portfolio Days, and more! Work, critique, and network with artists from around the world. Click here to apply. Whether you want to exhibit and lecture about your work, teach, write a book, or create an artist-run collective, MECA’s Master of Fine Arts Program encourages each student to think across traditional academic boundaries and challenge their art practice and intellectual curiosity. Studio-based, with renowned faculty, visiting artists and carefully selected graduate advisors, the curriculum emphasizes the intersection of studio production, individual research, critical analysis, and travel to important and inspiring locations. This structure promotes the development of a professional lifelong practice. 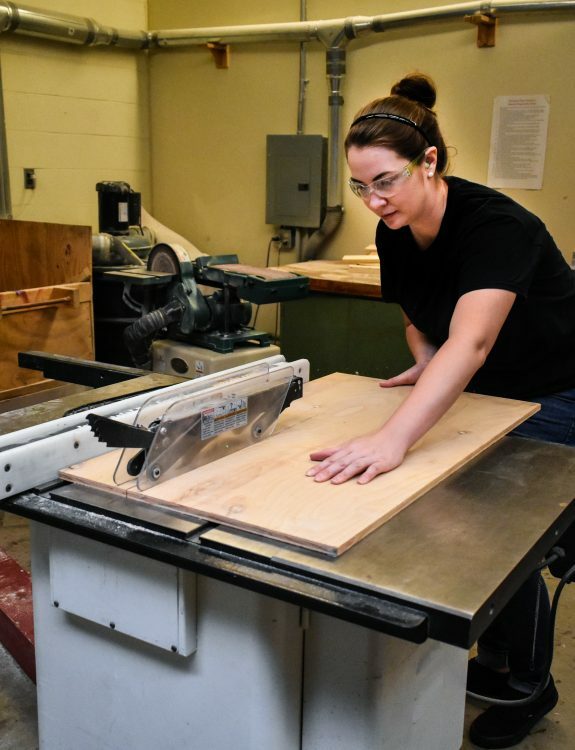 From the first moment of your first eight-week summer intensive, you will experience a truly individualized education and focus on becoming an inventive, skilled, self-disciplined, engaged maker in the world and in your own community. Choose from our Low or Full Residency options and base your studio wherever you decide— whether it’s on campus in Portland, Maine; or in our Low Residency Program anywhere in the world. Shelby Wynne Richardson ’17. Photograph by Kyle Dubay. Katie Coleman, MFA ’20. Photograph by Lauren Berg. Image of Brian Downs ’19 in his studio. Photograph by Erin Little. Inass Yassin ‘19, Installation in Jerusalem Lives the inaugural exhibition of The Palestinian Museum in Birzeit, Palestine. Steven Kelly, MFA ’20. Photograph by R. Katz. What is the difference between the Full Residency option and the Low Residency option? 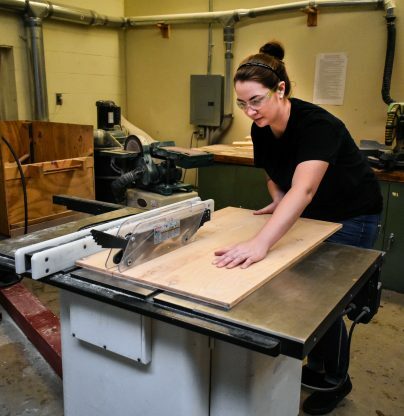 Students who choose the Full Residency option move to Portland, may have a studio, have consistent 24/7 access to MECA facilities and the activities that occur that happen in the College and around Portland during the school year. They are also able to take advantage of Graduate electives and Teaching Assistantships. Our low residency MFA combines intense periods of on-campus instruction in Maine with the freedom and independence of working from any home location. Our low-residency structure is designed for experienced artists who want the ability and independence to maintain their ongoing careers while earning an MFA. Both of MECA’s MFA tracks offer an interdisciplinary approach that encourages students to think across traditional academic boundaries and challenge their art practice and intellectual curiosity. What is MECA's low residency structure? 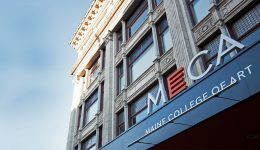 While most low residency programs offer 1-2 week on campus intensives, MECA is unique in offering an 8 week summer intensive trimester and a full fall and spring trimesters. The Summer Intensive trimester allows students a full semester of on campus experience each summer, while the Fall and Spring trimesters offer a full academic year of studio and coursework from a student’s home studio. Short Winter and May residencies (for graduating students) complement the fall and spring trimesters. The low residency structure features year round contact with core faculty and a local studio advisor who meets with each student in their home studio during the fall and spring trimesters. Studio time is complemented by a rigorous program of online coursework. The MECA MFA low residency track is a full-time 60 credit program of study. The academic year kicks off annually with an eight-week Summer Intensive in Portland, Maine. The Intensive begins in early-June and runs through early August. See the Academic Calendar for more information. How do I request program materials? You may request a catalog (here). You may open the downloadable PDF (here). What advice would you give about submitting my portfolio? Documentation of your work should be of professional quality. Choose images that best represent you as an individual. You may submit up to twenty images but we recommend that you thoughtfully edit the selection to support the ideas communicated in your letter of intent. 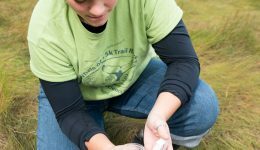 Describe your intended field of exploration to show us what materials, ideas, and approaches you are ready to embrace as part of your graduate study. Alongside an analysis of your recent work, describe how you anticipate your work moving in new directions in the future. Tell us how you are ready to challenge yourself and why you think MECA’s MFA will help you do this. Who are the Visiting Artists and Curators for Summer 2018? Please see Summer Visiting Faculty tab to the left. How do I find out more about Financial Aid and Scholarships at MECA? What are the academic dates for the year? Is there someone I can speak to about the MFA in Studio Arts Program at MECA? I decided to get my MFA at MECA because of the trimester structure of the program and the institutional emphasis on artistic excellence. I felt that by going to MECA I would not only develop my work but personal routines that would help me sustain a professional practice. My experience at MECA reinvigorated my art practice and took me in directions I never anticipated. The artists, writers, and thinkers I was introduced to there empowered me to investigate my work in ways that reached out as well as back. I emerged from the program a much more complete artist and thinker with a peer group that continues to enrich my work. Being at MECA gave me chance to experiment and grow with my work, to create a network of peers and friends, and to interact with and learn from a fantastic group of artists. Since graduating, I have coordinated the MFA Alumni Residency Program, which allows alums to return to campus in the summer and work alongside the current MFA students and faculty. I only applied to one grad school, because I knew it was the perfect balance of theory and practice for me. Little did I know that MECA would wreak havoc on my art practice and all my preconceived notions about art-making. MECA opened up a landscape of contemporary theory, practice, and possibility. MECA gave me the critical thinking skills I need as an artist working in a solitary, isolated atmosphere. The inner dialogue I developed at MECA continues to guide me as I move forward in my work. MECA’s MFA Program affirms how the unforeseen emerges in the repeated chances we take with the structures and gestures that inspire us. Therefore, art is never done. The MFA Program completely reinvigorated my art practice. I was more ready; every moment was like being inside a diamond—it was synergistic. Now I am not afraid to take on any kind of project, large or small, community-oriented, or very personal. I make whatever the moment calls for: interactive immersive video and sound installation or apple pie. I felt that by going to MECA I would not only develop my work, but personal routines that would help me sustain a professional practice. When did you graduate? Were you a full or low resident? May 2018 and I was a full resident in the program. Why did you decide to get your MFA at MECA? Where do you live now and what are you doing after graduation? I currently live in Fairmont, West Virginia. I’m teaching at Fairmont State University in Fairmont, WV. I am working on large-scale prints, relief sculptures, and a sculptural installation for a solo show next year at Real Art Ways in Hartford, Connecticut. More info can be found here. Do you keep in touch with your cohort? Since graduation, I have kept in touch with my cohort at least weekly (usually more). How has the MFA program impacted what you are doing today? I feel that the program acted as an idea incubator of sorts. I was able to work both instinctively and critically, exploring ideas that I could refine post-graduation as well as some ideas that needed to get out to be done. Speaking to how it has impacted what I am doing today, I am beginning to develop a body of work with explorations that began within the program. 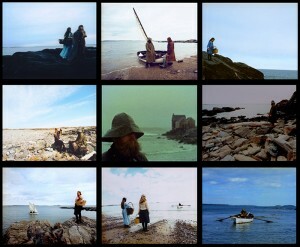 Maine College of Art shares deep roots with the Portland Museum of Art. In 1882, the Portland Society of Art was founded, which encompassed both the art school and the museum. Not until 1982 did the Portland School of Art (as it was named in 1972) separate into an independent organization with a renewed mission to educate professional visual artists. In 1992, the College was once again renamed as MECA to better reflect its status as a degree-granting New England school. 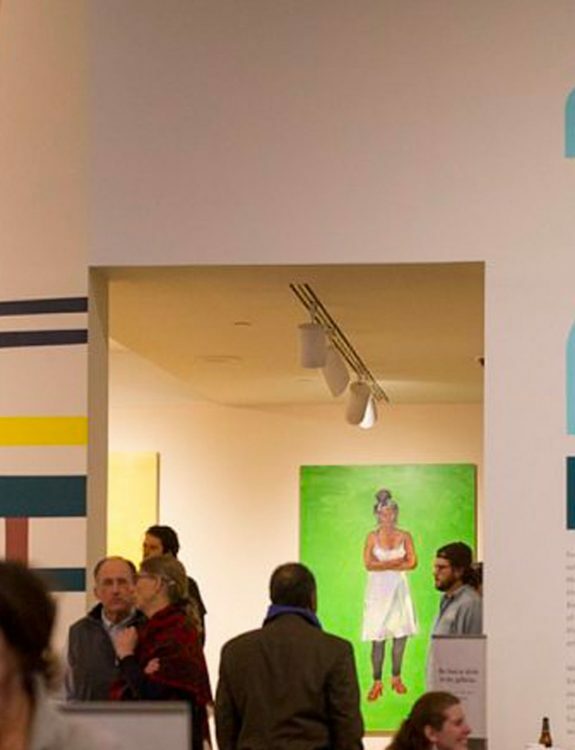 Throughout its transformations, MECA has always retained close ties with the Portland Museum of Art, both as our neighbor in the Arts District and in recognition of the collaborative arts community here. MECA’s first-year student orientation, for example, includes a visit to the PMA, and MECA has offered Drawing at the PMA as a Continuing Studies class. In 2013, the PMA presented Ahmed Alsoudani: Redacted, the first major museum exhibition of the work of American-Iraqi artist Ahmed Alsoudani ’05, one of our most successful alumni. PMA’s 2018 Biennial, a survey of contemporary art “intended to highlight artists with meaningful connections to Maine and enrich the cultural lives of the people of the state,” runs through May 30, 2018, and the 25 selected artists include many from the MECA community: David Driskell, Hon. DFA ’96, Gina Adams ’02, Jenny McGee Dougherty ’05, Anne Buckwalter MFA ’12, Adjunct Instructor of Foundation Stephen Benenson, Assistant Instructor of Illustration Daniel Minter, and Assistant Professor of Sculpture and MFA Joshua Reiman. 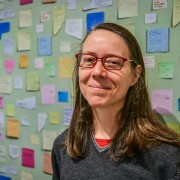 Nat May, the former executive director of SPACE Gallery (another vital arts organization and connecting point in downtown Portland, located between MECA and the PMA), was invited to curate the biennial this year. 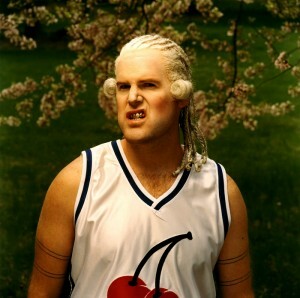 In addition to his work at SPACE for more than 13 years, May has been a strong influencer in the local arts community. To determine the final list, May assembled a team of arts professionals, which included PMA’s Judy and Leonard Lauder Director Mark Bessire, artist and Maine Indian Basketmakers Alliance co-founder Theresa Secord, and Skowhegan School of Painting & Sculpture Co-Director Sarah Workneh. 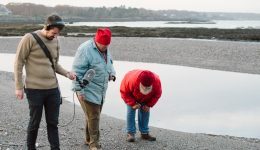 They each visited studios throughout Maine and the nation, meeting with artists who complement each other while reflecting Maine’s increasingly diverse community. In a change from past biennials, many of the artists will be exhibiting not just one singular work but several. 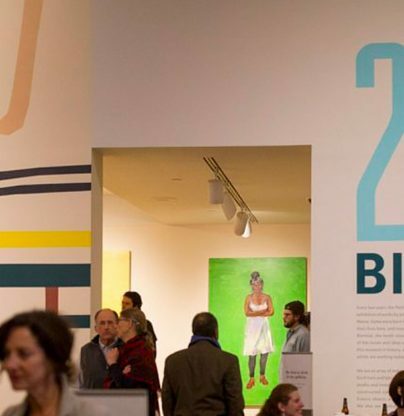 Header Image: The Portland Museum of Art Biennial 2018 opening party. Photo by Brianna Soukup, the Portland Press Herald. While in Los Angeles, I sought out the opportunity to gain more insight into the matter and visited the A+D Architecture and Design Museum. On display were the exhibitions Architectural Imagination and The Landscape Architecture of Lawrence Halprin. They contained preliminary work for architectural structures, refined models for the structures, and, in some instances, photo documentation of the completed projects, as demonstrated in the exhibition of Lawrence Halprin’s work. Halprin was a San Francisco Bay Area artist, notorious for his work within San Francisco’s Ghirardelli Square, an environment I had experienced first- hand just days previously. 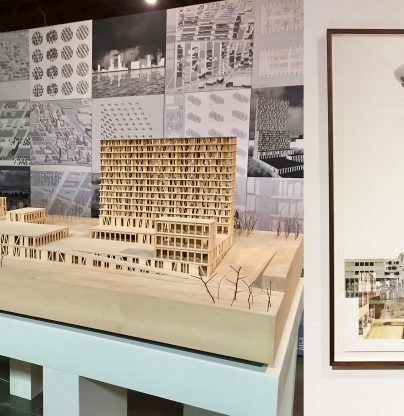 Speaking at the Architectural Imagination exhibition, I was floored by the combination of model and collage works operating in the context of exhibition as preliminary work for a larger project, but in my view also operating as stand-alone works. As collections of work, the exhibitions demonstrated innovative techniques for developing form within a variety of landscapes, shifting my perspective on how scale operates within a vast space and broadening my perspective on the ways that architecture shifts landscapes, both urban and rural. These exhibitions showed me how comparable these processes are to my own practice while challenging my perspective on how space and aesthetics, in response to an immediate environment, can function within both an exterior context and a gallery context. As collections of work, the exhibitions demonstrated innovative techniques for developing form within a variety of landscapes, shifting my perspective on how scale operates within a vast space and broadening my perspective on the ways that architecture shifts landscapes, both urban and rural. These exhibitions showed me how comparable these processes are to my own practice while challenging my perspective on how space and aesthetics, in response to an immediate environment, can function within both an exterior context and a gallery context. 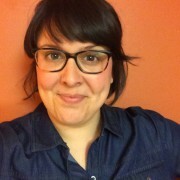 Kylie Ford MFA ’18 is a second-year MFA student who has exhibited her work nationally. Handmade collage on inkjet prints by Marshall Brown Projects/ Dequindre Civic Academy at the Architectural Imagination exhibit at the A + D Architecture and Design Museum in Los Angeles. Photo by Kylie Ford MFA ’18. 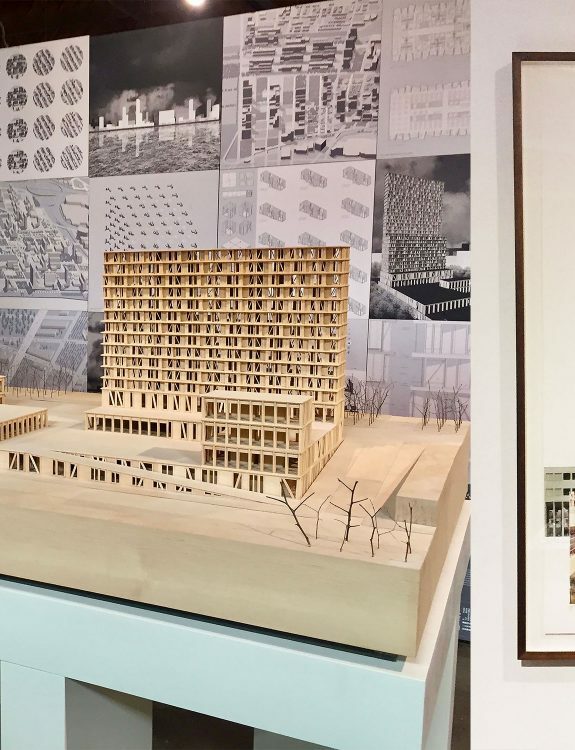 Model for “New Corktown” by Albert Pope and Jesús Vassallo of Present Future, at The Architectural Imagination. Photo by Kylie Ford MFA ’18. Tessa Greene O’Brien MFA ’16 and her husband, Will Sears, both painters, had a long-standing dream to fill the city of Portland with colorful, graphic works of art in public spaces. 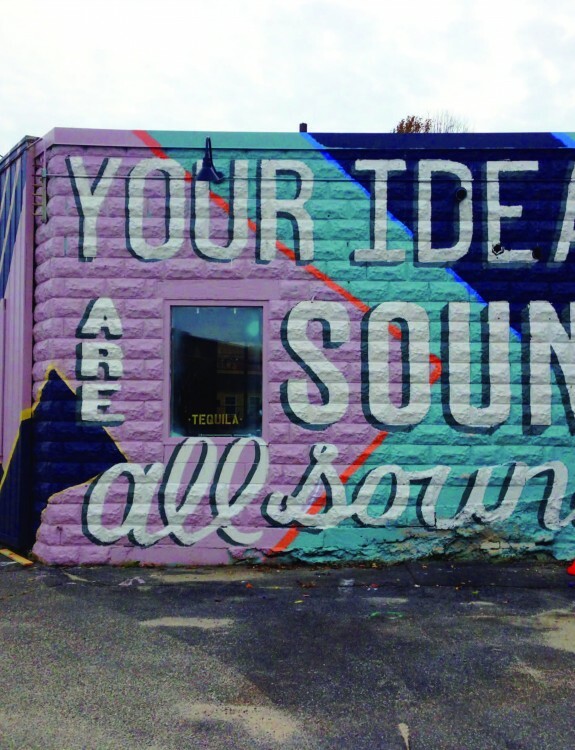 Immersed in the worlds of sign painting, murals, and large-scale festival and installation work, the pair wanted to create opportunities for communities to come together around art that celebrated both the contemporary art world and the vernacular of place. In 2015, with a grant from the Kindling Fund—administered by SPACE Gallery through a regranting program funded by the Andy Warhol Foundation for the Visual Arts—O’Brien and Sears were able to co-found the Portland Mural Initiative, which now has six murals and architectural interventions under its name, and plans for future works underway. “We have learned a lot about public art and community engagement since our inception,” says O’Brien. 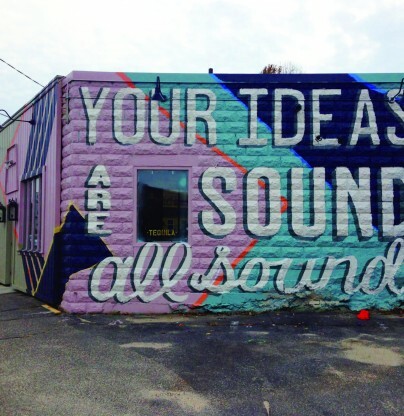 The Portland Mural Initiative has worked with several private businesses along Portland’s Bayside Trail that have offered up walls to emerging and established artists whom O’Brien and Sears have commissioned. They’ve also worked as far away as Kittery, in addition to their signature work in Portland. Understanding that artists are not separate from the communities they live and work in, O’Brien and Sears have diligently attended to fostering dialogue among artists, organizations, and community stakeholders. The Portland Mural Initiative has hosted free public meals at openings for murals and a series of artist talks designed to connect the public to the work. As the Portland Mural Initiative moves into its fourth year, O’Brien notes that they have dialed back the scale of the project in order to pursue projects that they’re passionate about, even if that means taking on fewer projects per year. 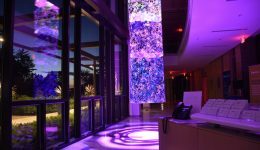 “Our hope is that the artist’s creative vision is not dulled down through extensive design by committee,” O’Brien reflects. As the Portland Mural Initiative gains recognition and momentum, she and Sears are being careful to honor both the artists they work with and their own creative practices. 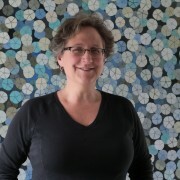 In addition to working on several of her own commissions, O’Brien also has an active studio practice and recently attended painting residencies at the Vermont Studio Center in Johnson, Vermont, and at Hewnoaks Artist Colony in Lovell, Maine. While new projects are underway, viewers can currently take a stroll or cycle along the Bayside Trail to see murals by O’Brien, Sears, and Dougherty, as well as by Andrea Sulzer and Greta van Campen, and can get updates from portlandmuralinitiative.org. 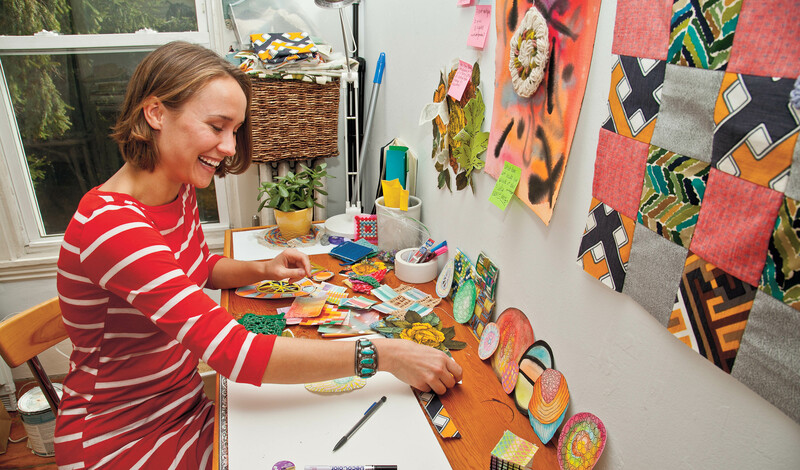 Jenna Crowder ’09 is an artist who works in installation, curating, and writing. 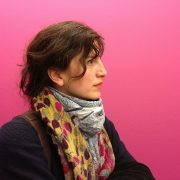 She earned her BFA in Sculpture at MECA and has worked internationally on public and collaborative art projects. 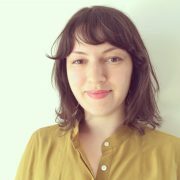 Jenna is currently a member of the Portland Public Art Committee and is a member artist at Pickwick Independent Press. 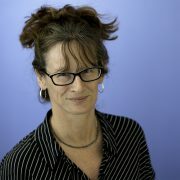 She is the co-founding editor of the online arts journal The Chart. I work to appropriate what is culturally and aesthetically perpetual and evident in my understanding. Using the language, in this piece, intends to create fluctuating meaning that aspires to release the language from any ideological charge. I was invited to take part in the inauguration exhibition of The Palestinian Museum in Birzeit. 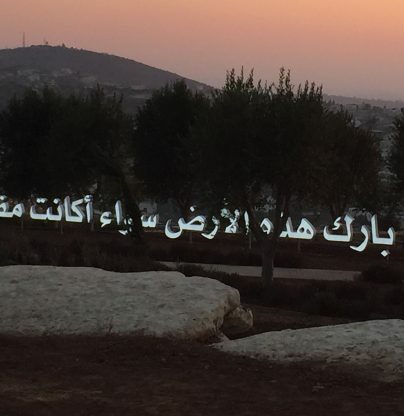 I finished my summer intensive course at Maine College of Art in Portland and went back to Birzeit, which is 20 kilometers north Jerusalem, to install my new work in the garden of the Palestinian Museum as part of Jerusalem Lives. 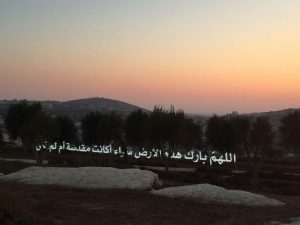 I worked with the museum staff and some friends to install the work and then the work came together as luminous words made out of light boxes that were suspended above the ground and surrounded with olive trees. The piece read “God Bless This Land Whether It Was Holy or Not”. 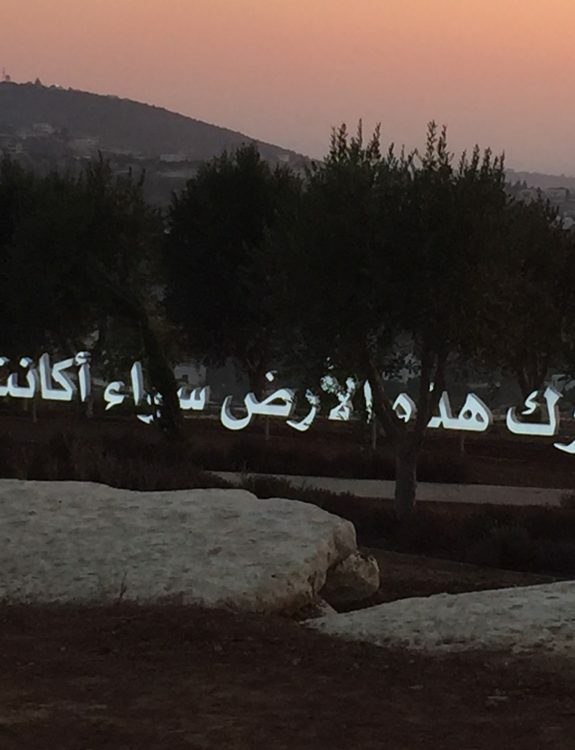 The work was installed in one of the orchards where the backdrop shows Jaffa and the Mediterranean Sea as if they are close to reach, but they are not. Inass Yassin, God Bless, 2017, Light boxes 18.5×1.2m; Acrylic 3mm, PVC 3mm, PVC 5mm, National Paint, LED waterproof. In my previous works, I looked into cinema and photography as determinant components in Arab modern culture. In my studio, I work to appropriate what is culturally and aesthetically perpetual and evident in my understanding. Using the language, in this piece, intends to create fluctuating meaning that aspires to release the language from any ideological charge. It was articulated as twisted common daily pray that touches on faith and question dogmas. The work reads clearly in the daylight and it gets dark, it lights up. It stands in the landscape, day and night with a changing scenery and changing mode of reading the piece. The “Adan”: call for prayer, from the neighbor mosques, the fog, the shadows of the trees, became part of reading the work and what it means. However the most surprising experience, was watching some sort of foxes who left their grottos in the last hours before the sunrise, to play among the artworks in the garden. They came very close to us while we were documenting the work, drinking tea with sage. Inass Yassin has multifaceted practice that examines the modernity in the Arab culture, inspired by her personal reading of transformation. Shift in space and social structure has been main theme in her painting, installation, film and photography work, Yassin is a former director of Birzeit University Museum and a current Fulbright grantee at Maine College of Art. Visit her site here. Curated by Reem Fadda, Jerusalem Lives (Tahya Al Quds) opened on August 27. It was the first exhibition at The Palestinian Museum and will be on till 30th January 2017. The exhibition is participatory work, consisting of four chapters that examine the cultural, political, economic and ideological aspects of Jerusalem. 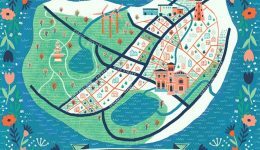 The exhibit includes works by 48 artists; 18 works were large-scale commissions in the museum’s extensive gardens ‘based on ideas about land, openness and non-exclusion’. The Jerusalem Lives exhibition attempts to study and examine the city of Jerusalem as a case study, a microcosm or condensed laboratory that metaphorically represents globalization and its failures, and to find answers that inspire us to struggle for a better future. Assistant Professor in MFA Julie Poitras Santos‘ site-specific visual practice takes many forms, including installations, video, performances and public projects. 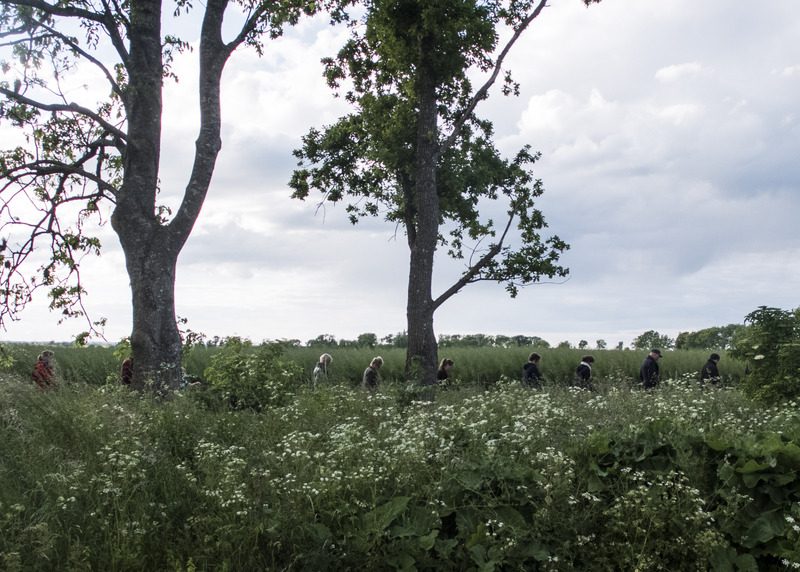 Much of her recent work uses walking as a means to create community, investigate richly sited ways of knowing, and narrate new territories. This fall, Julie will be teaching ‘Walking Art History’ as an Academic Studies class. 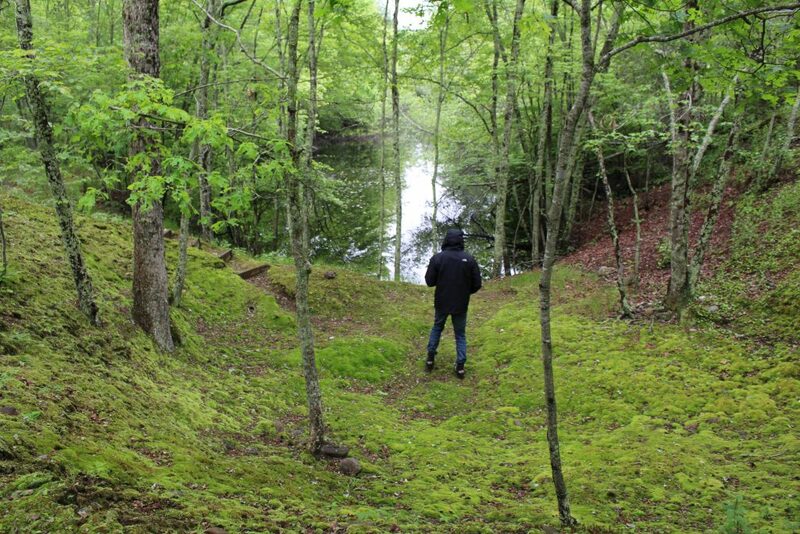 One of twelve artists recently selected to create work for the 2017 IPark Site Responsive Biennial in East Haddam, CT, Poitras Santos was in residency for three weeks this spring making “green is the forest we wander (a locus, an echo, an amble)“, a 15-minute site-specific audio walk that invites participants into the forest imaginary populated by things magical and unseen. 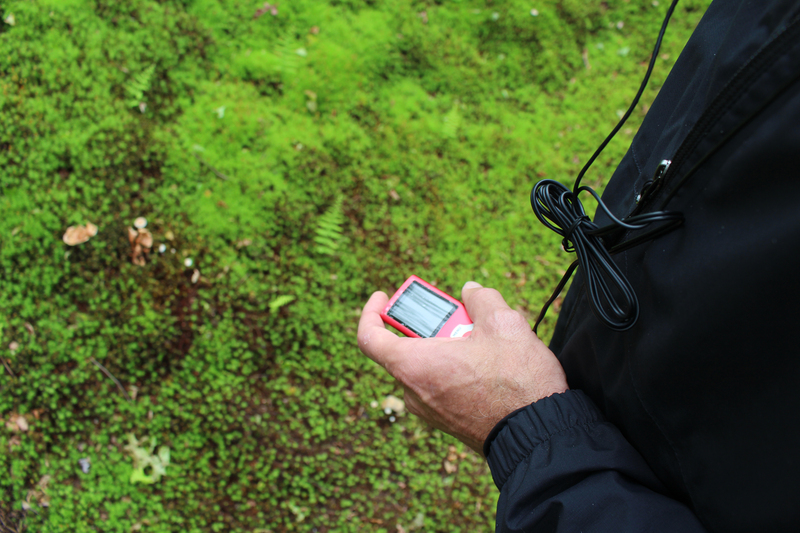 Using cues in the landscape as guides to research, on-site investigation, and poetic inscription, the audio essay wanders through Mie’s Trail, a reclaimed gravel pit and natural preserve on the IPark grounds. 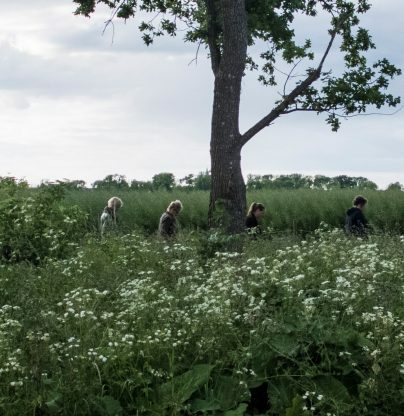 Poitras Santos discusses this work along with an upcoming project in Sweden in a recent interview for Konst i Blekinge (Art in Blekinge). You can listen to the podcast here. (the interview is Swedish, with Julie talking in English). 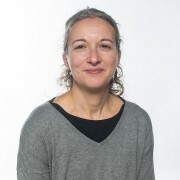 In August, Poitras Santos will be joining the Milena principle and presenting her work along with other artists and experts in diverse fields for “Made of Walking, La Romieu,” an international forum focusing on dialogues between performance, art, literature and new media related to walking practices. The forum follows the theme of “listening to the ground,” honoring the work of Pauline Oliveros. 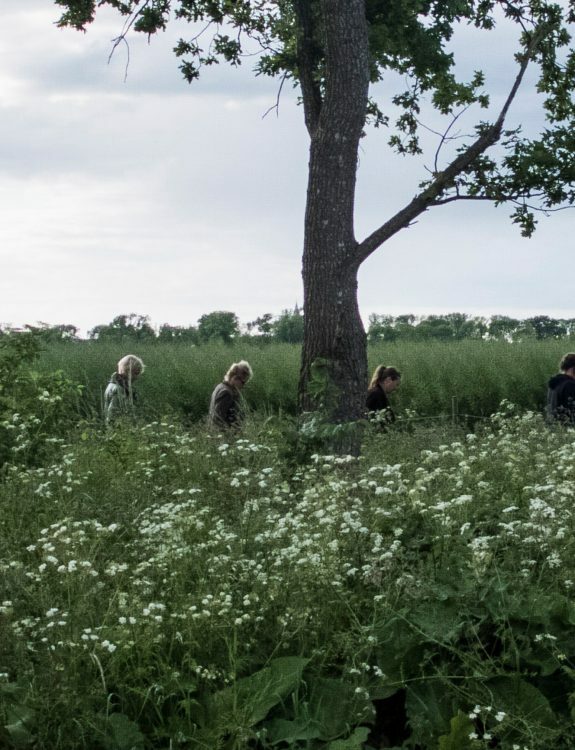 Additionally, an upcoming essay this fall in Living Maps Review details “Map & Universe,” a walking based artwork she created in southern Sweden in May 2016. Closer to home, a 50-page catalogue detailing last summer’s PLATFORM PROJECTS/WALKS 2016 (funded by SPACE Gallery through the Kindling Fund) was released in April with an accompanying public walk through the Portland peninsula. The catalogue contains photos, essays by Poitras Santos and Barbara Louder, and walk descriptions from the fifteen artists who were invited to participate in the initial project. 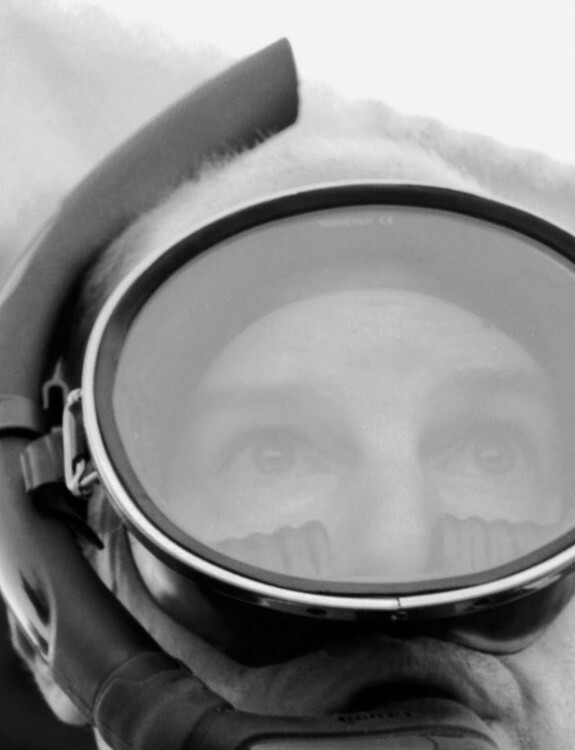 I encourage my students to be curious, thoughtful explorers of life and visual culture. Participating in this process of discovery and potential is extremely rewarding. 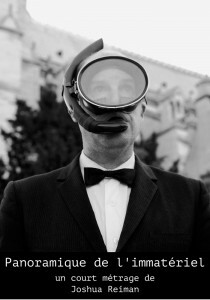 Visitors to Joshua Reiman’s website are greeted by the enigmatic film still of a man in a suit and bow tie climbing up from the Seine river in Paris with a snorkel mask perched on the top of his head. The character is from Reiman’s film Panning for the Immaterial (2015). He is looking for the gold from Yves Klein’s 1959 seminal conceptual artwork Zones of Immaterial Pictorial Sensibility, where Klein dumped gold into the Seine as a gesture of selling a space that does not exist. The muted elegance of the image aptly reflects Joshua’s multifaceted and exploratory artistic career, which currently includes teaching at MECA as an Assistant Professor of the MFA in Studio Art + Sculpture. Joshua’s work often uses iconic figures from art and politics to “anchor new narratives at the junction of where reality and fiction meet” and his work has been exhibited in galleries and museums across the United States, in Germany and in Estonia. 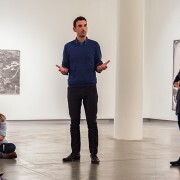 Prior to joining MECA, Joshua was a visiting professor of art at Carnegie Mellon University where he taught sculpture, installation, and site work. 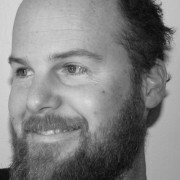 Josh has an MFA in sculpture from Syracuse University and a BFA in sculpture from the Kansas City Art Institute. 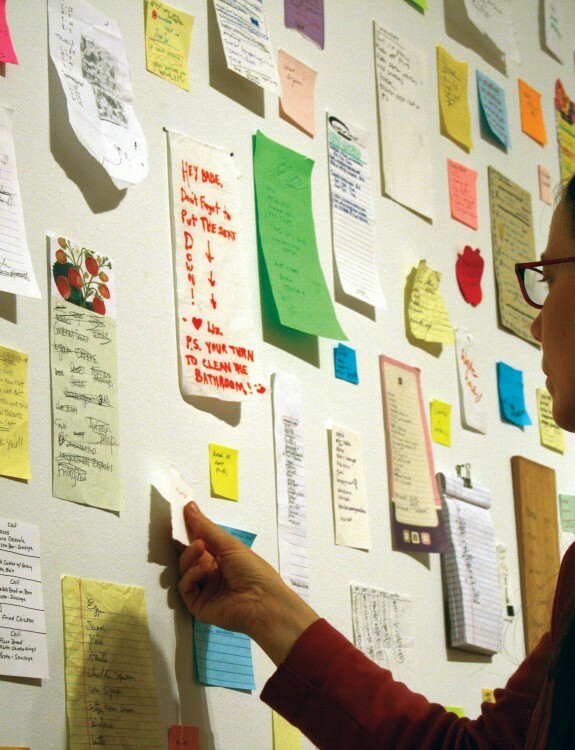 'To do' lists highlight the ever-evolving line between wants and needs. 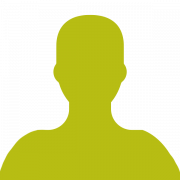 What differentiates MECA from your own college and grad school experience? MECA’s intimate scale facilitates symbiotic flow between faculty and students. Of course, significant connections evolve at all schools. However, I doubt I had nearly the influence on my instructors in college or grad school that my extraordinary students have on me. They continually enrich my life and expand my views of how art functions for us individually and culturally, ever-increasing the consciousness I bring to teaching, making, and being. Was there a professor who stands out in your mind as having influenced you? One salient influence was Stanley Lewis. After studying drawing with him, I avidly took his painting classes, which included a good dose of art history. Like me, Lewis thinks and speaks in non-linear fashion, so he issued me a series of permission slips. He went beyond teacher to mentor for me while some peers chafed against his teaching style. No teacher can be all things to all students, or perhaps not even one thing to all students. However, when a teacher’s emitters hit a given student’s receptors, that artist can take what is received and run with it, likely being further ignited by something another instructor, peer, or influential experience offers down the line, and in turn inspiring others. The whole deal is a marvelous Rube Goldbergian delight. Why do you work in the medium you do? I make mountains out of molehills and traffic in human aspirations, tastes, and accomplishments, choosing media best suited to a given concept. 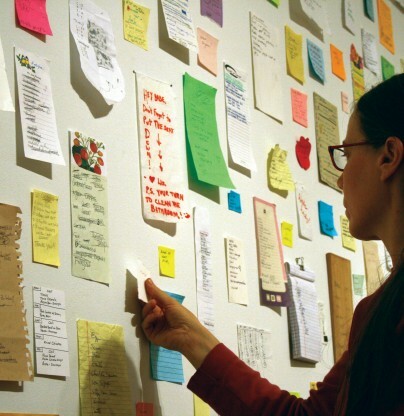 “To do” lists highlight the ever-evolving line between wants and needs, with wilder fluctuations across cultural borders. What may be a pressing need in one part of the world, such as potable water or access to health care, may not even be on the radar for someone where such things are taken for granted until an emergency. By examining the lists others make, my viewers often identify with some of the wants or needs of other people. Small details hand-written on the list of a stranger might remind us of the struggles others have that we don’t, or perhaps challenges we have surmounted, generating compassion for others and ourselves. What do you do when you hit a creative wall? Sorry, that question does not compute. I hit lots of walls—few of them creative. Yes, they are constructed, but most (if not all) of them are illusions. 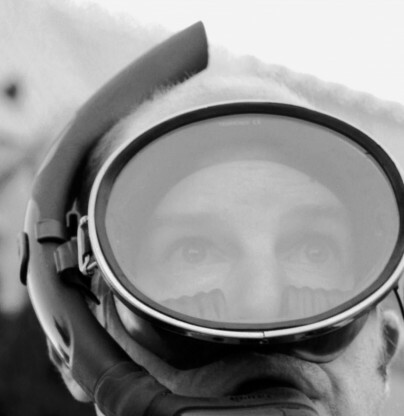 How do global events and issues, whether contemporary or past, inform your practice? I research what humans do with their time, energy, and attention today. Global events and issues take a lot of those three resources to absorb, yet they can also infuse us with energy as well as clarify priorities. That in turn certainly trickles down to our “to do” lists. I mine the extraordinary by immersing myself in the [purportedly] ordinary. Have you ever worked / presented outside of the U.S.? For a 2008 exhibition organized by Professor Ling-Wen Tsai called The Crossing of Time and Environment, in Toshei Village, Taiwan, I issued a call for photos of plastic bags snagged in trees and implicated myself as part of the problem by laminating images I gathered, and hanging them in trees on the “chosen barren land” where installation occurred. Recently I was invited to design a two-sided banner installed on lampposts in tiny towns in Denmark. The website ET4U.DK documents this exciting public art project bringing diverse work— much of it politically charged—to quiet streets traveled by tractors, school buses, bicyclists, and families turning into their driveways. I only understood the magnitude and potential of this project by walking the streets of these towns this summer. Seeing work virtually is simply not a full-bodied substitute for experiencing it in the flesh, and I encourage students to experience art directly. What country, that you have never visited, would you like to visit? The red and black palette of my inlaid burnishing clay panels derives from ancient Greek ceramics. I would love to find some lists hand-written today in Greek, a language we associate with ancient times and remote priorities, and yet spoken and written today in a country experiencing economic upheaval and thus constantly shifting priorities. I also welcome any lists readers wish to mail me care of MECA!